Once turned on it calibrates to its environment and then detects an object approaching (well, let's face it, a cat, this is about cats). At a certain threshold it starts the mad barking. The project is based on original brilliant work by LuckyResistor. We've collaborated to bring this project to Boldport Club members, although the highly optimised MCU code — every bit is sacred, every bit is great — is solely the work of LuckyResistor. PissOff was project #9 of the Boldport Club. The circuit transmits infrared (IR) signals and then measures the amount of reflected energy. At a certain threshold of reflected energy it reads an audio file from the microSD card and plays it. We recommend barking. (In theory, if you insist, it could also be an enticing call for your cat Jimmy to eat the lovely roast that you just took out of the oven and planned to serve for guests from Argentina... we don't care!). We recommend that you solder the components while the individual boards are still attached to the 'frame'. Pay attention to polarity: a dot or a bar that corresponds to a marking on the board. For LED D3, the arrow points to the cathode, where the bar is. For D1 and D2 make sure that you place the correct components (D1 is black, and D2 is blue) and at the correct polarity, as indicated on the board. (Note that on the printed schematics D2 was erroneously labelled as D5). If you'd like to use solder-paste, we've arranged for OSH Stencils to sell a stencil for the board at a 15% discount! Just use this link to add the stencil to your order (the discount will already apply). The resistors have their value printed on them (use this guide to figure out what the codes mean). Capacitors don't have their values printed on them; for this we've marked the 1uF capacitors with a black line across the strip in this kit. The 'face' is electrically connected to the main board using three rigid wires. Cut the piece of wire in the kit to three equal segments and solder the corresponding holes in the main and face boards. Once that's done you can snap the boards out of the frame. Use a file to remove excess fragments from the break points. The battery holder takes 3 AAA 1.5V batteries. It has two wires; the red is power (Vbatt) and the black is ground (gnd). Those wires are long so we'll cut them to about half their length and solder them to the speaker. Solder the wires to each of the two most 'external' pads of the speaker. Then solder the other end to the speaker pins on header J2. Even though there is a '+' and '-' on the board the polarity doesn't matter for this speaker. Now solder the red and black wires from the battery pack to Vbatt and gnd, respectively, on header J7. Place the battery pack under the board so that the power switch pokes through the corresponding hole in the PCB. For both the speaker and battery pack use double-sided tape, Blu-Tack, or some other sticky stuff to hold them in place. This isn't mandatory, though. The audio file is stored on a microSD card. It is loaded onto the card just like you'd load any other image, like those for a Raspberry Pi operating system, for example. Get the sound file and read more information about the process at LuckyResistor's project page. When all components are placed and speaker and batteries connected, point the 'face' to a clear area and change the switch to the 'ON' position. Wait a couple of seconds for the MCU to calibrate to its environment and then put your hand in front of the face; you should then hear the barking! Congratulations; you can now protect your food from Jimmy the cat. Turn the potentiometer VR1 all the way counter-clockwise using a screwdriver. This sets the volume to maximum. 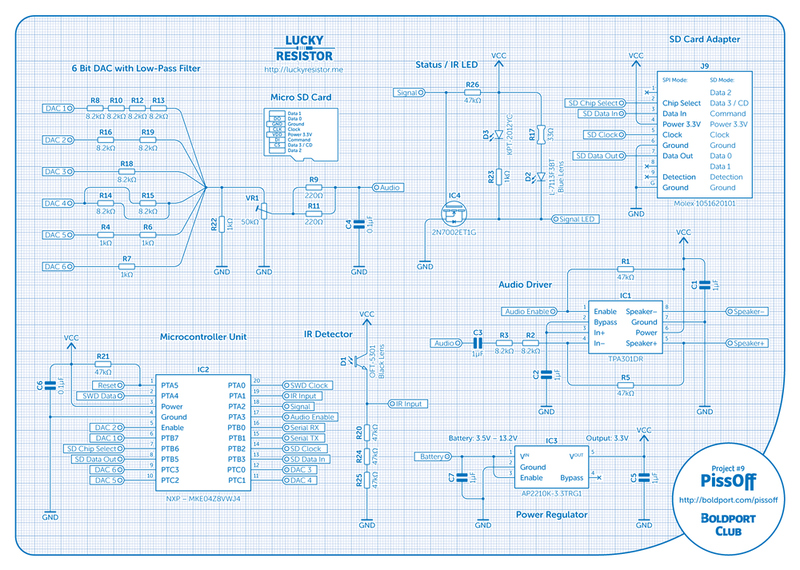 The software for the MCU has been authored by LuckyResistor with a comprehensive guide here. As a summary, one can connect the board to a serial port useful debug information — simply connect at 112500 baud through header J4 — and type 'main' after connection and then 'help' to see options. The MCU comes programmed so it should 'just work' without programming. If you wish to re-program the MCU, you'll need an SWD programmer to connect to J11.